The Bureau of Land Management (BLM) recently proposed several parcels of land for oil and gas leasing in close proximity to the boundary of Dinosaur National Monument (DNM). Numerous interested stakeholders, including and the National Park Service, asked the BLM to defer some of the parcels nearest to the DNM’s boundary to protect the experience of tourists and recreational visitors to the area. By protecting DNM’s natural resources, Uintah County will also protect its potential to diversify the local economy by attracting more recreational visitors. Outdoor recreation thrives on clean air, stunning vistas, and an escape from the background noise of day-to-day life. 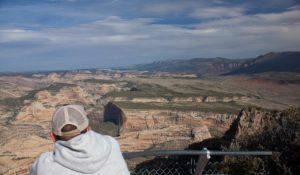 This is what places like Dinosaur National Monument and the surrounding areas offer to those pursuing recreation in these wild places. Once energy development begins, those unique opportunities are significantly marginalized. The recreation industry is often impacted by development in multiple ways. Air and water quality, light pollution, viewsheds and soundscapes are all major factors affecting the outdoor recreation experience. But air quality in the Uintah Basin already suffers considerably and this development proposal will only exacerbate this problem with increased emissions from construction, well drilling and production operations. Fugitive dust from road construction and operations can impact air and visibility quality for a radius of up to 50 miles from the site. Aside from air quality, energy development outside DNM will impact the viewshed, dark night sky and natural soundscape of the area that visitors come to experience. Dinosaur National Monument is an important economic driver in Uintah County, with long term growth potential. Yet, these leases have the potential to jeopardize Uintah County’s outdoor businesses and associated economic benefits. Take action and urge the BLM to revisit this proposal and analyze potential impacts to recreational experiences and the local tourism economy and remove these parcels from the Utah December 2017 lease sale. For more information and to comment on this lease sale proposal, see this link. See also PLS’s white paper “Best Practices for Balancing Recreation and Energy Development on Our Public Lands” here.